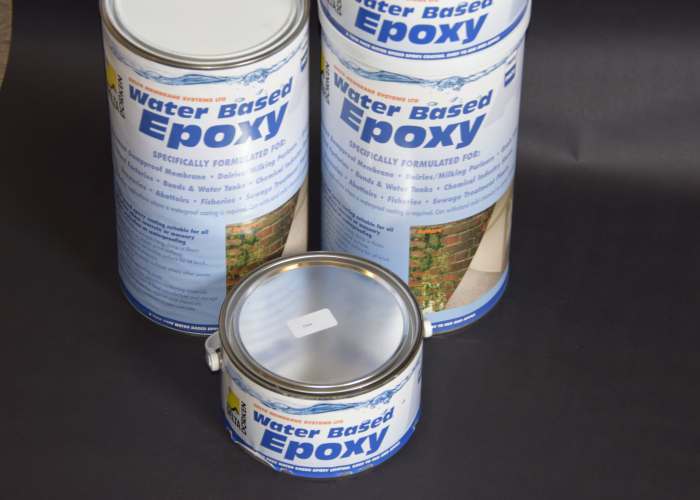 A twin-pack water-based epoxy coating suitable for all applications where concrete or masonry requires protection or waterproofing. Delta Water Based Epoxy Resin is suitable for all applications where concrete or masonry requires waterproofing and protection. It is applied in the same manner as ordinary emulsion paint with the added benefit of application in damp conditions. Once dried Water Based Epoxy leaves a tough, non-toxic, waterproof, easy to clean surface. Water based epoxy resin will coat over most other finishes but best results are achieved when surfaces are free and clean of other coatings. Any greasy film should be removed prior to application to ensure a sound key. Voids, holes and gaps must be carefully filled. Mixing Delta water-based Epoxy couldn’t be easier – simply remove the ring which holds both tins together. Add Pack B into Pack A (larger tin) stirring continuously. Stir well to ensure that the hardener is completely dispersed, then add water to the fill line indicated, stirring continuously.